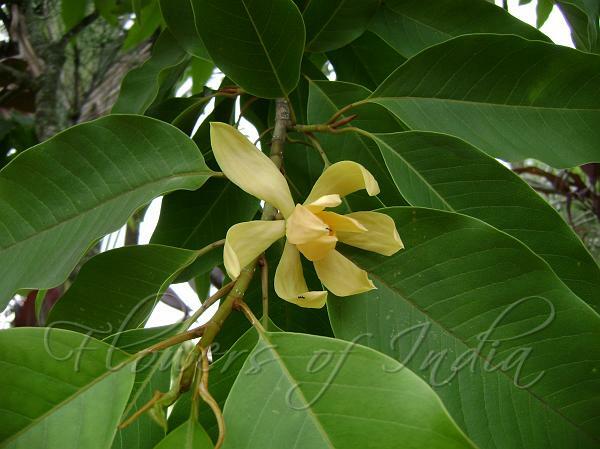 Champa is very well known flower native to the Himalayas, and popular for its fragrant flowers. It is a tree up to 50 m or taller, up to 1.9 m d.b.h. Flowers are fragrant, tepals 15-20, yellow, inverted-lanceshaped, 2-4 x 0.4-0.5 cm. Staminal connective is protruding and forming a long tip. Buds, young twigs, young petioles, and young leaf blades are pale yellow velvet-hairy. Twigs are ascending and forming a narrow umbelliform crown. Stipular scar 0.3-1 x as long as petiole. Leaf-stalks are 2-4 cm, leaves elliptic or ovate, 10-20 x 4.5-10 cm, slightly puberulous below, base broadly wedge-shaped or rounded, tip long-pointed tp falling off. Fruit is 7-15 cm; mature carpels obovoid-ellipsoid, 1-1.5 cm, tuberculate. Seeds 2-4 per carpel, rugose. 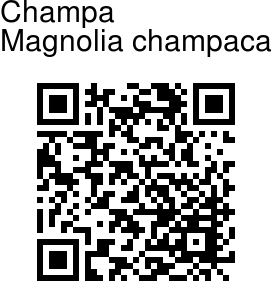 Champa is found in the Himalayas, up to NE India and SE Asia, at altitudes of 600-1300 m. Flowering: June-July.